There's also a "copy to clipboard" option. Available for: Users with “Comment” permissions and above. 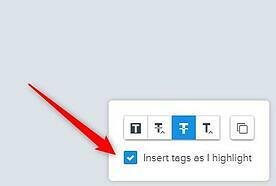 The text selection tool can be opened by clicking on the markup button (1) and then choosing the “T” icon (2). Once you click on the icon, the text selection menu will appear on the left side of the comment box. - this is used for highlighting text. Press your left mouse button and drag it over the text you wish to highlight. Enter your comment into the "New comment" box and click on the green button. The highlighted text will now be tied to your comment. - this is used for replacing text. Press your left mouse button and drag it over the text you wish to replace. Enter a comment describing in detail what should be changed. - this is used for deleting text. Press your left mouse button and strikethrough the text you wish to delete. Enter a brief comment about this markup. - this is used for inserting text. Press your left mouse button and drag it over the space you wish to insert text. Enter a comment explaining what should be inserted. We allow text selection from the following file types: pdf, doc(x), ppt(x), xls(x) and for web capture. When a reviewer selects text on the proof, the text selection type tag will be added to the comment where the cursor is currently. The user can delete the tags like they can remove @mentions in the comment box. There are 4 types of tags that can be added to the comment depending on the text extraction tool that is used by the user: SELECTED, INSERT AFTER, REMOVE TEXT, REPLACE TEXT. Adding tags may be switched off by disabling this option in the text selection menu. Copy to clipboard function cannot be replaced by using Ctrl+C shortcut. The only way for copying highlighted text is using the “Copy to clipboard” button.